See you at the Boston ACS? Can we agree on the structure represented by a SMILES string? This benchmark is aimed at improving SMILES interoperability, and compares the hydrogen counts found when different software reads the same SMILES string. The benchmark focuses on SMILES reading rather than writing as only once we can all agree on the meaning of a particular SMILES string, can we start talking about errors in SMILES writing. The full dataset and results are available from http://github.com/nextmovesoftware/smilesreading, and the poster below summarises a cross-section of results. In short, it is commonly believed that the count of implicit hydrogens on each atom in a SMILES is whatever is chemically sensible (which of course means different things to different people), whereas in fact there is a table in the Daylight specification that describes exactly how many hydrogens are implicit on each atom. Part of the confusion is that people think that you add hydrogens when reading a SMILES, whereas in fact the job of a SMILES reader is simply to set the number of hydrogens to that present in the original molecule. As you can see from the results below, while one may choose not to follow the Daylight specification, the inevitable consequence is that hydrogens magically appear and disappear as SMILES strings move between spec-compliant and spec-non-compliant software. 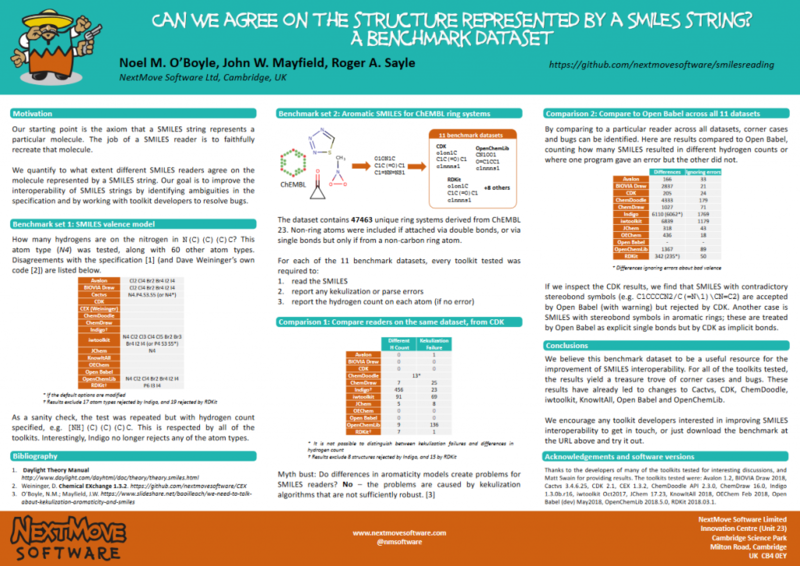 The poster generated quite a bit of interest, and so I’m hoping to work with more vendors/developers to improve SMILES interoperability before I present this work at the Fall ACS. Please do get in touch if this is of interest.